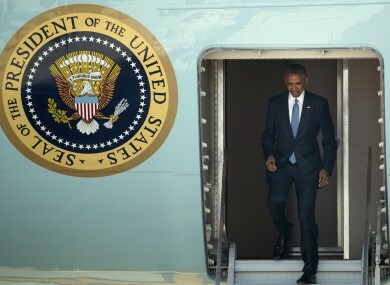 Obama departs Air Force one at Hangzhou airport. WHEN US PRESIDENT Barack Obama arrived in China today for his final trip to Asia as commander in chief, the ceremonial niceties were marred by an undiplomatic shouting incident on the tarmac. Chinese authorities have imposed extremely tight security precautions for the G20 summit, and not even US National Security Adviser Susan Rice and the White House press corps proved exempt when Air Force One landed in host city Hangzhou. As usual when Obama travels, the reporters accompanying him were brought under the wing of the Boeing 747 to watch him come down the aircraft stairs, penned off behind a blue rope installed by Chinese security. But that was not far away enough for the Chinese personnel, one of whom screamed at White House staff, demanding the US press leave the scene. A female White House official, handbag over her arm, told him that it was an American plane and the US president. “This is our country!” the Chinese official, in a dark suit, shouted at her in English. When US National Security Adviser Susan Rice and senior White House staffer Ben Rhodes tried to get closer to the president, lifting up the blue rope and walking under it, the official turned his ire on Rice, trying to block her progress. As they exchanged angry words her Secret Service agent stepped in to usher her past him. Moments afterwards the US president’s motorcade was rolling away, towards a city of nine million people that has been denuded of around a quarter of its population for the event. Hangzhou has gone to some extraordinary measures to ensure the G20 goes smoothly. Factories have been closed to ensure blue skies, potential troublemakers detained, and the wide boulevards of a city lauded by Venetian traveller Marco Polo are empty. The Hangzhou city government ordered a holiday for businesses in the downtown area from 1-7 September, according to an official social media account. The G20 meeting will be held on 4 and 5 September. The G20 meeting will be held tomorrow and on Monday and was boosted by this morning’s announcement that both the US and China have signed up to the Paris accord which seeks to fight climate change. Email “'This is our country!' says Chinese official as Obama lands for G20”. Feedback on “'This is our country!' says Chinese official as Obama lands for G20”.